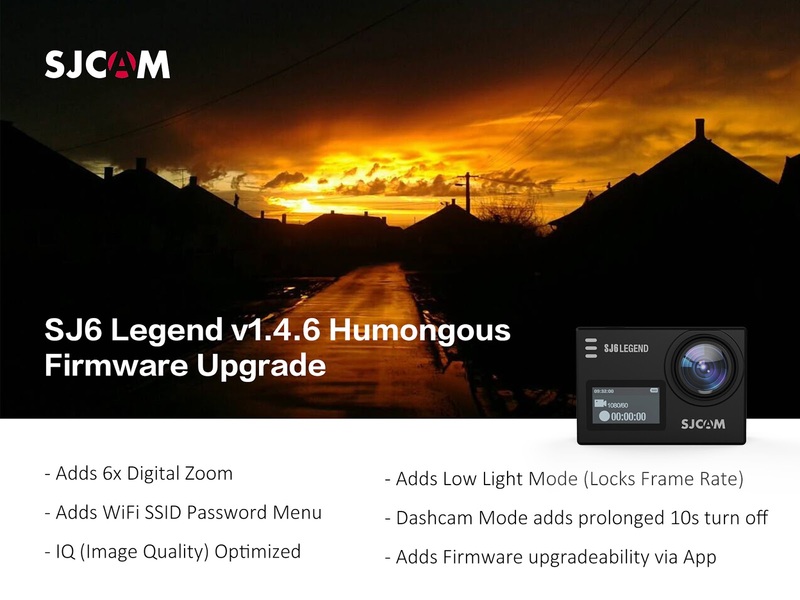 The long-awaited SJ6 Legend Series 4k Action Camera firmware updates are finhally here. 2. Screen now stays off when selected off and unit is rebooted. 4. Fixes 720p and APP issue which cause camera to crash. 5. Adds in underwater mode, please OK for more than 2 seconds to switch from photo/video. 6. Fixes when Gyro turned on, distortion correction icon will not be displayed. 7. Updates so that when press power button down long, the camera will turn on first, then the lights blink. 8. Fixes when distortion correction is on and sharp picture is selected, sometimes fisheye correction doesn’t work. 9. Adds Low Light Mode option – Turn Mode off in low light and frames will not drop (but video will be darker). 11. Loop video record default set to 3 minutes. (Need to turn to factory default settings to realize zoom). 13. Resolves the freezing issue due to VGA resolution not supporting fish eye correction. 14. Fixes battery icon issue where when switched from photo to record, icon shows battery is full. 15. In car mode, unplug the charger and a delay of 10 seconds is added before shutoff. Please email SJCAM and let us know if you find any issues or have suggestions.